When a man wants to look polished and professional, nothing beats a shirt with French cuffs and a handsome pair of cuff links. This classic look is a bold statement about his confidence, sophistication and sense of style. When a small detail makes such a big difference in the way he looks and feels, shouldn’t your man own a pair of Sorella personalized cuff links? 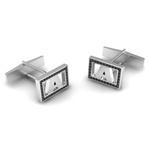 Celebrate the holidays, his birthday, graduation, promotion or your engagement with a gift he will always wear proudly. Choose from single initial, monogram and Chinese symbol styles, and we will custom make it for him in palladium, 18k, 14k, or 10k gold or sterling silver.